Physicians were poorly trained, inept and even dangerous through most of the nineteenth century. Civil War doctors, for example, had no knowledge of germs, did not endeavor to keep their hands clean, and might explain away disease as the will of God. The quality of their education varied widely, and states lacked uniform licensing requirements. But even well-trained doctors were often powerless in the face of disease, since few effective drugs were available for them to prescribe. Having no idea what caused diseases, they often dosed patients with purgatives and emetics, believing whatever the cause of illness, it could be forced out through the gut. Small wonder, then, that rural Americans preferred the gentler and more familiar herbal remedies prescribed by family women and by the more specialized "granny women." bottle. Dosage: 1 teaspoon twice daily. Recipes for remedies were handed down from generation to generation. Women learned to doctor the same way they learned to cook. The preparation might begin with hog lard or honey. Plants were then added, gathered from hillsides or grown in the garden. Most mothers had some knowledge of natural pharmaceuticals, but some were more accomplished herbalists than others. The most knowledgeable were termed "granny-women." Many years of growing herbs and dispensing remedies made granny-women indispensable assets to their communities, which they served not only as pharmacists, but as obstetricians and nurses as well. A granny-woman's several health care roles required much skill and wisdom. She was the possessor of a store of information about local pharmacology. She may have learned her art from another granny woman. If she were literate she probably consulted home medicine guides and herbal handbooks. She usually learned about native plants from her own mother and grandmother, who may have been granny women themselves. Her female line may have been first taught by neighboring Indians. She knew how much of each ingredient to use (often measured by the pinch or the handful), how long to boil (till soft, or till all water save a pint had boiled away), and how much to administer. She knew whether the herb should be decocted (boiled), infused (steeped but not boiled), or demulcified (used in an ointment). She knew to use the leaves of a plant for one ailment, its roots for another, and its berries for still another. She also knew that the seeds of some plants could be medicinal though their flowers were poisonous. She knew how to treat each herb so as not to destroy its healing power, and precisely when to harvest the plant. Most roots had to be gathered in February or March, before the sap began to rise. Roots lost their value after the sap rose. Some plants--sassafras and poke, for example--became poisonous at certain points in their growth cycle. Seldom did the granny woman's remedies cure the patient; instead, they alleviated the symptoms. But since it seemed to be the symptoms which were fatal, this was a highly effective type of medicine. 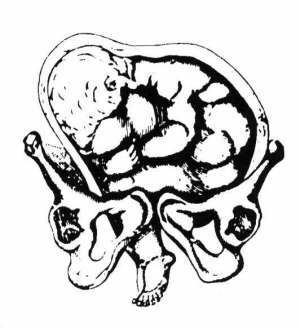 Engraving showing fetal position during a breech birth from Charles D. Meigs, The Philadelphia Practice of Midwifery (Philadelphia, 1838). During complicated deliveries, midwives consulted books like Meigs' for assistance. Meigs' advice to the midwife in cases of breech delivery concluded, "It is best.., to permit the breech to descend, and not in any manner to interfere with the feet until they are spontaneously born." The pharmaceuticals administered by granny women consisted of a variety of organic and inorganic compounds. Among the most commonly used medicinal plants were those with astringent qualities, such as sweet gum, myrtle, and yellow dock, which grew wild in the Ozarks hills. Taken in a tea, such plants would shrink the swelling of a sore throat. Used for tonsillitis or diphtheria, they would leave the patient considerably more comfortable and also lessen the danger of asphyxiation. Packed into a poultice and applied to the skin, the astringent properties of these plants helped to close open wounds and stem bleeding. The selection of herbs for use in medicines was hardly random; many food plants were never used to treat the sick because they had no medicinal value. Only remedies which brought relief were retained. The granny woman's most important role was as a midwife. By the 1890's, some Ozarks babies were being delivered by male doctors; but probably most rural women continued to rely on the traditional practice of being attended by a granny woman. Furthermore, even when a doctor was called, the baby sometimes did not wait for him to make the arduous trip over muddy roads, across creeks, and up steeply sloping hills. Thus, mothers usually had both a granny-woman and other female neighbors in attendance during delivery in case the doctor was delayed. Granny-women were not formally trained, but many carried a "midwife's book" to assist during complicated deliveries. If a granny woman's own children were grown, she was free to stay with a woman for days at a time. A doctor could of course not do this. And finally, even if a doctor were present, he often relied upon the assistance of the midwife since there were no trained nurses available. Granny-women might perform a number of rituals which doctors found silly and irrational. Some were designed to give the mother psychological, if not physical, relief from her pain. She might give the woman her husband's hat to hold during the ordeal, thus bringing him symbolically into the delivery room. If the labor were particularly severe, she would place an axe or knife under the bed to "cut" the pain in two. Sometimes, weather permitting, she would throw open every door and window in the house, in a symbolic representation of opening the birth canal. But psychological support could only go so far to relieve childbirth pain, and granny women also kept the staple nineteenth century drugs laudanum, morphine, and quinine--in their pharmacopoeia. Before the creation of the Food and Drug Administration in 1906, which began restricting the sale of drugs except by doctor's prescription, these medicines were readily available in local drugstores. When the mother's pain grew too relentless, the midwife would simply give her a morphine tablet. A granny-woman's techniques involved ritual, some superstition, and effective and creditable pharmaceuticals. She combined manufactured pills with her own tried-and-true home remedies. She would give a mother blackberry tea (an astringent) both during and immediately after the birth to prevent hemorrhaging. She might also dose the mother with raspberry tea, which relaxes uterine muscles and improves the efficiency of labor. Another therapeutic drug in her arsenal was slippery elm bark to speed delivery (used also, by the way, as an abortifacient). When labor was protracted, the mother might be "quilled": a turkey quill filled with snuff was blown into her face. The resulting sneezes helped expel the baby! Though some 90% of births were normal, the other 10% were often fatal to the infant. A midwife could address some delivery problems; others she could not. If a baby were in a breech position, the granny woman usually did not intervene. A breech delivery was long and painful, but the child would likely survive. A facial presentation or a crosswise presentation (in which the arm or foot presented first) was another matter. The baby could not be delivered in any of those positions, so the midwife reached into the birth canal and tried to turn the baby. This technique sometimes succeeded; but when it did not, the child usually died in the birth canal. In such a case, it was common practice among both doctors and midwives to save the mother by dismembering the dead baby, or by performing a "craniotomy." All experienced midwives carried a special iron hook with them for this procedure, in which the baby's skull was perforated and its contents evacuated. The skull was then crushed, and the mother was either allowed to deliver naturally or the baby was pulled out. In most cases, however, the midwife found it unnecessary to intervene, and she allowed nature to take its course. Midwives were far less likely than doctors to use forceps. Physicians, who did not have time to stay with a laboring woman for days on end, often resorted to forceps simply to speed delivery. It was a dangerous practice. Forceps could introduce bacteria into the womb and cause puerperal fever. Puerperal fever, not childbirth itself, was the leading cause of maternal death in the nineteenth century. The most dangerous time for the mother was the ten to thirty days after the birth, when bacteria introduced into her womb multiplied and spread throughout her system. By the late 1800s, however, as the germ theory of disease became understood and antiseptic techniques were taken up by physicians and many midwives, the risk of dying from a post-birth infection declined radically. While a doctor perceived his job to be finished once he had delivered the child, the midwife stayed to care for the newborn and the recovering mother. She might wrap the newborn in its father's shirt or its mother's petticoat for luck. Many midwives washed the newborn's eyes in the mother's milk or even the mother's urine. A woman from Alpena, Arkansas, explained that urine "was what they always used when she was young and in her mother's time too. They used this instead of silver nitrate that they use now." Most midwives also gave the child a weak catnip or onion tea to make the infant break out in hives, considered essential for the child's health. Having doctored both mother and baby, the midwife would then depart, leaving the mother in the care of her female neighbors and kin. They would see that her household chores were taken care of for the next few days, allowing the new mother to remain in bed. Granny women, it is clear, rendered a kind of care that physicians could not reproduce. It involved far more than simply dispensing a drug: It meant giving psychological support, material comfort, and empathy -- something that only another woman who had undergone the same experience could provide. But by 1900, doctors were beginning to resent midwives, whom they looked upon as their main competitors for business. The developing medical profession had begun to insist upon better education, standard examination procedures, and licensing requirements for all practicing physicians. Throughout the United States physicians waged a campaign to run midwives out of business by portraying them as ignorant and dirty. It is true that antiseptic techniques were probably not practiced by most midwives in the nineteenth century. However, granny women did not go from one laboring mother to another, as obstetricians might, and so did not spread germs in the way that doctors had done before antiseptic practices were introduced. Furthermore, midwives--like all women--routinely cleaned and scrubbed their homes, dishes, clothing, and utensils. They certainly washed their instruments after attending a delivery, and the first thing they did after every birth was clean up the bed and the mother as well as the infant. Some even hung the birthing room walls with clean sheets while the mother labored. Perhaps their attire was not a sterile garment; but granny women as a group were not nearly as dirty as physicians made them out to be. As for the charge that they were ignorant, it was certainly true that granny-women had little, if any, formal training. But physicians made efforts to deny it to them! While European countries were establishing schools of midwifery and making a place for midwives in the practice of medicine, American doctors were refusing to admit women to medical schools and demanding, simultaneously, that all people practicing medicine be trained and licensed. "Regular" physicians, in other words, offered no compromise to the midwives. State after state bowed to the wishes of the AMA and required licensing, which in effect put midwives out of business. Thus, by the 1930's, except in the most remote and inaccessible districts where no doctors were available, few midwives were in practice anymore. Adopting the scientific method in the field of medicine obviously brought many advances. But in forcing midwives out of practice, doctors did a great disservice. By refusing to admit that midwives had anything to offer the practice of health care, regular physicians denied the profession the granny-woman's kind of nurturing, holistic care which, too often, the science of medicine neglected. To the trained physician, the patient became a number on a chart, whereas to a granny-woman the patient was a neighbor down the road. As women began to enter hospitals to give birth, they lost the multi-faceted support and psychological help that the traditional practice of midwifery and home birth had provided. Medical science today, ironically, is re-discovering how important community and family support are to people recovering from any kind of illness. Recent studies have shown that new mothers sent home from the hospital with no help or guidance are more likely to suffer post-partum depression, and are more likely to abuse--even kill--their infants. Formerly in the Ozarks, as in most traditional communities, a birth mother was never expected to fend for herself. In the Ozarks it was believed to be bad luck to leave a mother and her infant by themselves after the birth an axiom some dismissed as "an old wives tale". No midwife would have tolerated sending a new mother home from a hospital one day after a birth to deal alone with the responsibility of keeping a home and caring for an infant. Midwives saw to it that a new mother had proper psychological, social, and material support. Modern physicians have often been oblivious to such components of health care, focused as they may be upon microbes and body parts. But since the 1970's, when medical schools opened their doors to women, the situation has been changing. Medical schools have begun to soften the "masculine" emphasis upon technology and adopt a more "feminine" nurturing style, now understood to be of great benefit to patients. Doctors are now being trained to see medicine, as granny women did, not just as a science but as an art. It is now apparent that doctors had something to learn from the techniques of the granny-women after all. If only they had recognized this sooner, granny-women might be among us still.